First to be published was the complete text of the copies of Portuguese roteiros (navigation aids) that he had made in Goa: Reys-gheschrift van de navigatien der Portugaloysers in Orienten, inhoudende de zeevaert soo van Portugael naer Oost Indien, als von Oost Indien naer Portugael. 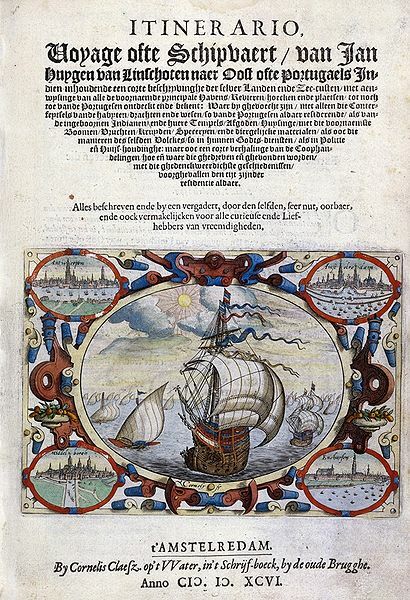 Cornelis Claesz., Amsterdam (1595) This extraordinary book provided Dutch navigators with the text of 67 roteiros (in English 'rutters') prepared by Portuguese or Spanish pilots (some of them named), enabling them to find their bearings from one port to another. Chapters 1-9: from Portugal to Goa. vice-versa. Chapters 10-14: from Goa to the Coast of Bengalen. Chapters 15-19: from Cochin to Malacca. Chapter 20: from Malacca to Macao. Chapters 20-23: navigation on the coast of Siam, Kambodja and Anam. Chapter 24: from Macao to Strait Singapore. Chapter 25: very detailed description of navigation east of Sumatra to Bantam. Chapters 26-28: from Bantam to Sumatra. Chapter 29: from Java to China. Chapters 30-43: the navigation on the coasts of China and Japan, limited to Kiushu and Shikoku. 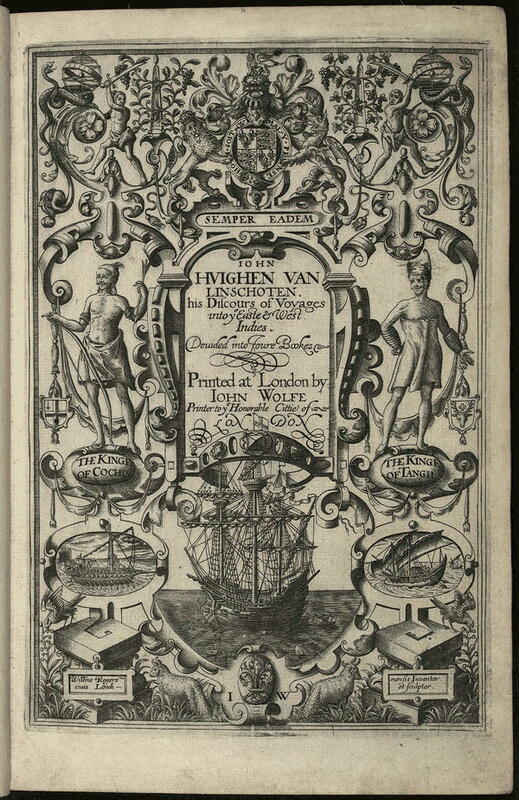 Chapter 36: describes the famous voyage of Dirck Gerritsz. Pomp (nicknamed Dirck China) from Macao to Nagasaki, from 5-31 July 1585 on the ship Santa Cruz. Ultimately the Santa Cruz returned to Goa, where Jan Huygen boarded. (5) Chapter 41: describes the voyage of Dirck Gerritsz. in March 1586, from Nagasaki to Macao. The roteiro, written by the Portuguese pilot of the Santa Cruz is very informative on the dangers of the Chinese Sea: currents, typhoons and riffs. Chapters 43-49 provide informations on tides, currents, wheather, signs in the sky, predicting tempest and the time of the year when typhoons are dominant. Chapters 50-67: deal with the navigation between China and Mexico, between Portugal and Brasil and on the coast of West-Africa. Chapters 52-54: contain the roteiro's by the Spanish captain Francisco Gualle, in 1582-1584, between Manilla and Acapulco. Chapter 55 : is a report by Nunod a Silva, a Portuguese pilot, who was a captive on board Drake's ship. In 1596, the text of the Reys-gheschrift was included as Book 3 in the much fuller Itinerario. 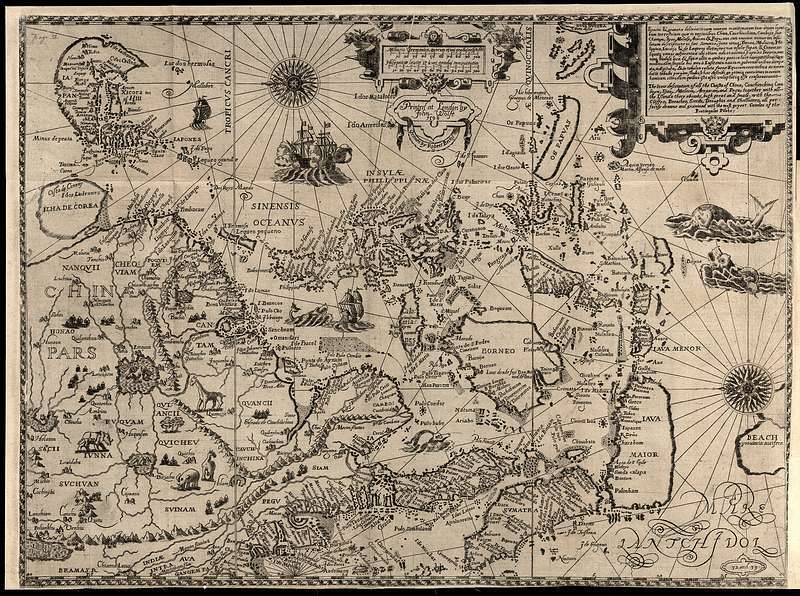 This, translated and reprinted with or without the maps, had great importance in the discovery of the seas of Asia. The book, which played a key role in shaping modes of Dutch colonial expansion, was a huge success. Following the first Dutch edition (1596) were a German and an English edition in 1598, a Latin edition (1599) and a number of French editions (1610, 1619, 1638). Some of these editions include the plates, but do not always include the maps which had added to the success of the first Dutch edition. Page 48 A little beyond Iapon under 34 and 35 degrees, not farre from the coast of China, lyeth another great Island called insula de Core, whereof as yet there is no certaine knowledge, neither of the greatnesse of the countrie, people, nor wares that are there to be found. (2.) The Third Book [begins page 307] The Navigation of the Portingales into the East Indies, containing their travels by Sea, into East India, and from the East India into Portingall, also from the Portingall Indies to Malасса, China, Iapon, the Ilands of Iava and Sunda, both to and fro, and from China to the Spanish Indies, and from thence backe againe to China, as also of all the coast of Brasilia and the Havens thereof. [Chapter 30 begins on page 361] The 30. Chapter. The course together with the description of the Iland of Canton, with all the coasts, havens, and pointes of the kingdom of China, to Liampo & Nanquín, with the situation and stretchings of the same. At the end of these Islands there lyeth two islands together, whereof the Channell that runneth betweene them hath a verye good harbour, it is called Lepion, they lie close by a great River, which is much inhabited and frequented by Marchaunts and other people. In this Haven of Lepion the Iapons doe often Trafficke: from the end of this Island along by the sea coaft the land is low and bankey ground, for that a mile from the land it is but a fadome and a halfe deepe, being hard stones. The people of ye country passe over it with nailed barkes, with pitched orloopes, two peeces, sailes of reeds оr mats, in an iron dreg with sharpe teeth. This coast reacheth Northeast to foure and thirtie degrees, where there lieth a great river that commeth from Nanquyn, within the mouth ог entry hath an Islапd that is inhabited by many people, both horse and footemen. This Island maketh the river to haue two mouthes or entries, from thence forward the land reacheth North North East, and by East, and comming to that part which lieth Southeast, there the land hath an end or point, and by that meanes it maketh a great creek. From this point forward, the coaft runneth North again, after turning again Northwestward : Into the which coast those of Iapon do ordinarily come to Trafficke with the Countrey people called Cooray, and there you have Havens and harbors, having a kind of small open paeces of woven worke, which the Iapons fetch from thence, whereof I am certainely informed, as also touching the navigation unto that land by pilots that have sailed and searched сleane through it, as followeth. From this point of the Creeke of Nanquyn twenty miles Southeastward there lyeth certaine Islands, at the end whereof on the east side, there lyeth a very great and big Island much inhabited, as well by horse as footemen. These Islапds by the Portingales are called, As Ilhas de core, but the great Island Core is called Chausien, on the Northwest sidе it hath a small Creeke, wherein there lyeth аn Island, which is the Haven but it is not very deep. There the Lord of the country hath his pallace and is continually resident. Five and twenty miles Southeast from this Island lieth the Island of Goto, one of tbe Islands of Iapon, which lyeth from the point of the Creeke of Nanquyn East and by North, to seaward sixtie miles, or somewhat more. This instruction I had from a Nobleman of Portingale, called Pero da cunha, that hath seene and travelled through all the Countrey, having by him all advise serving for the purpose, as being of great experience, having arrived and stayed in the Countrey aforesaid by tempest and stогmy weather against their wils, minding to sayle to Iapon, and from thence againe to the aforesaide Islаnd of Goto, the Islаnds lying from this island towards thc land betweene them, and close about them all over, are many riffes and stones. The instruction of the creeke of Nanquyn I had from an expert Pilote borne in the lande of Algaive in Spaigne, that lost his Shippe upon the Sands that sticke out from the River of Nanquyn, having runne round about all this Creeke with a Barke, and hee saide that being being within when the sunnne rose, it came from over the land, and that from the river of Nanquyn there ranne some sands and droughts, reaching southward to two and thirty degrees, and to the middlе way of the Goulfe of Iapon. Here endeth the description of the furthest part that the Portingales have sailed, along by the Coasts, lands, аnd Islапds of the kingdome of China, being that part thereof which at this day is knowne and discovered.